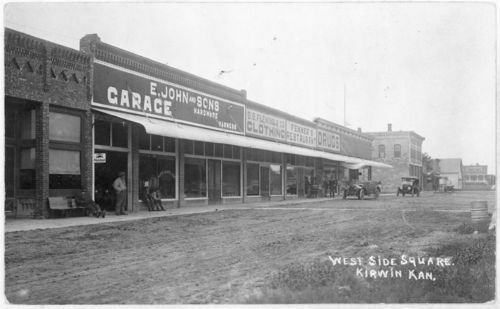 This photograph shows a view of the west side of the town square in Kirwin, Kansas. Businesses visible include E. John and Sons, Garage, Hardware, and Harness; D. B. Fleming and Company Clothing; Fenner's Restaurant, and a drug store at the far end of the row of buildings. There are a few men visible on the sidewalk in front of the buildings, and three automobiles are visible along the street to the right side of the picture.